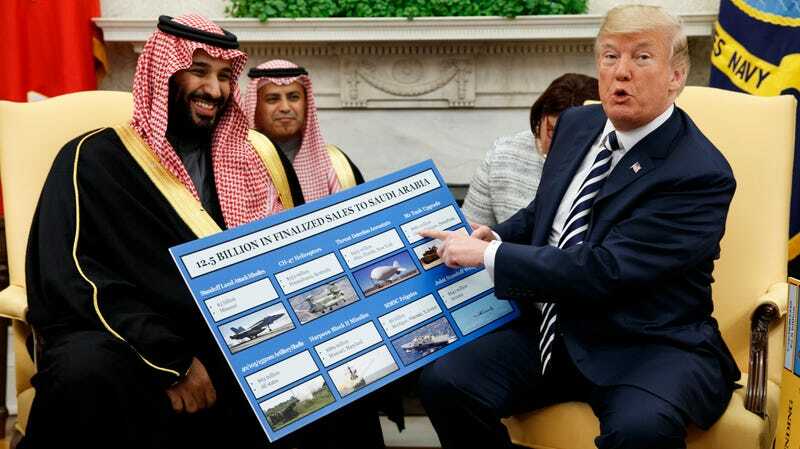 President Donald Trump and Saudi Crown Prince Mohammed bin Salman at a meeting in the White House on March 20, 2018, at an event touting U.S. arms sales to the Saudi military. Secretary of Energy Rick Perry approved six “secret authorizations” to allow companies to sell “nuclear power technology and assistance” to Saudi Arabia as part of a plan to win a deal to help build at least two nuclear power facilities in the country, Reuters reported on Wednesday, citing a document written by the Department of Energy’s National Nuclear Security Administration. News of the secret authorizations was first reported by the Daily Beast, which cited two people “with knowledge of those approvals.” The six approvals, known as 810 authorizations, allow for the U.S. companies to perform some preliminary work such as providing specific details of the work they will perform and sharing some information on nuclear technology, but they do not clear the companies involved to actually ship equipment to Saudi Arabia yet, a source told Reuters. South Korea and Russia are among other countries—of which there are many—competing for the deal, Reuters wrote. Officially, the plants are for civilian use, but any nuclear technology transferred to Saudi Arabia could be used for weapons development. Last month, House Democrats accused Donald Trump’s administration of attempting to sell nuclear secrets to the Saudi government, with one whistleblower suggesting that any U.S.-Saudi nuclear deal that does not undergo a legally mandated congressional review or abide by certain non-proliferation requirements could violate the Atomic Energy Act of 1954. A prior Beast report claimed that late last year, State Department staffers had been “furiously” preparing what is known as a 123 agreement, which puts certain conditions on technology transfers including a ban on its use for nuclear weapons development and requires recipient countries to seek U.S. permission to enrich uranium, to comply with the 1953 act. However, the House Dems accused the administration of previously attempting to dodge these requirements, as well as trying to skip the congressional review process. This is particularly troubling because Saudi Arabia not only has an atrocious human rights record (including the recent torture and murder of journalist Jamal Khashoggi), but has stated that it will pursue the acquisition of nuclear weapons if it believes that regional rival Iran is doing so. A Washington Post article earlier this year, citing satellite imagery, noted there is speculation among “weapons experts and image analysts” that Saudi Arabia has built a facility to produce ballistic missiles. In a hearing with U.S. Secretary of State Mike Pompeo on Wednesday, Representative Brad Sherman raised the possibility that Trump and Saudi Arabia are trying to sneak through a deal that would usher in a nuclear arms race in the Middle East, the Beast wrote. Reuters wrote that Pompeo responded that he would look into which companies received the authorizations, as well as stated that the Trump administration was pursuing safeguards against nuclear proliferation. Additionally, Trump’s son-in-law Jared Kushner reportedly recently shut out embassy staff from a meeting with his buddy, de facto Saudi ruler and heir to the throne Crown Prince Mohammed bin Salman. There was some concern among both State Department staff and members of Congress as to what was discussed, the Beast reported. Earlier this week, the Government Accountability Office, a congressional watchdog agency, said it was in the early steps of a probe as to whether the Trump administration complied with legal requirements while attempting to win the deal.